adobongblog: Care for a crumpet? 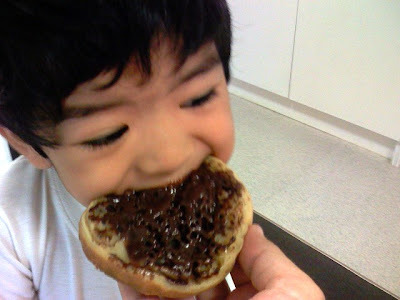 A crumpet is a savoury/sweet bread snack made from flour and yeast. It is eaten mainly in the United Kingdom, but also in the nations of the Commonwealth. 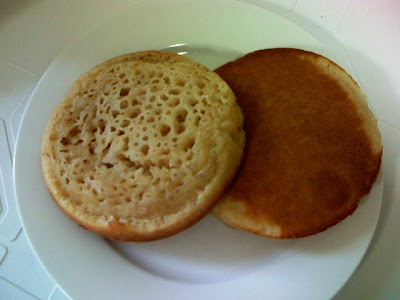 Crumpets are generally circular though rectangular varieties also exist. They have a distinctive flat top covered in small pores and a resilient, slightly spongy texture, being very porous. 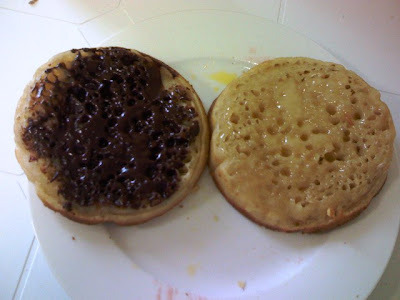 Crumpets alone are bland and generally eaten hot with a topping (usually butter). Other popular accompaniments include cheese when melted on top of the crumpet, poached egg, jam, Marmite, marmalade, honey, peanut butter, cheese spread, golden syrup, lemon curd, and maple syrup. 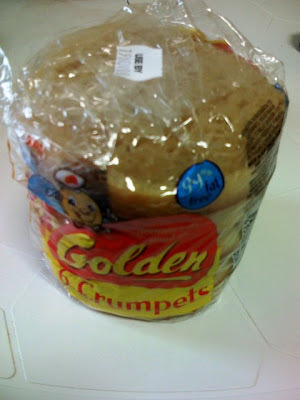 So there we were, doing our regular grocery, when we chanced upon some crumpets. 6 pieces at $1.50 seemed reasonable and so we bought one pack. We have been using an oven toaster with a "crumpet" option so I guessed preparation was as simple as heating it up in the toaster. And it was. 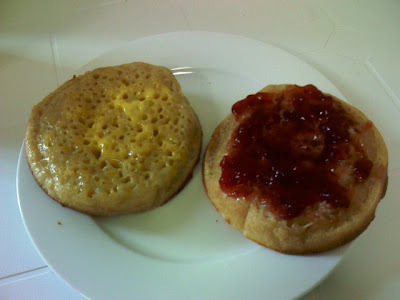 I would say the crumpet is like a mini pancake minus the delightful sweetness and softness, so you do need to put your favorite spread on it. So let's have a little experiment, shall we? Let's raid the cupboard and have a jolly time trying out different spreads. One was dabbed with butter, and another with jam. The second set featured dark chocolate and honey. So which spread did we like best with our crumpet? The dark choco! Jo-Lo agrees. I don't think I've ever had a crumpet but it looks similar to an English muffin. You can't beat warm bread with butter and jam. Delicious!